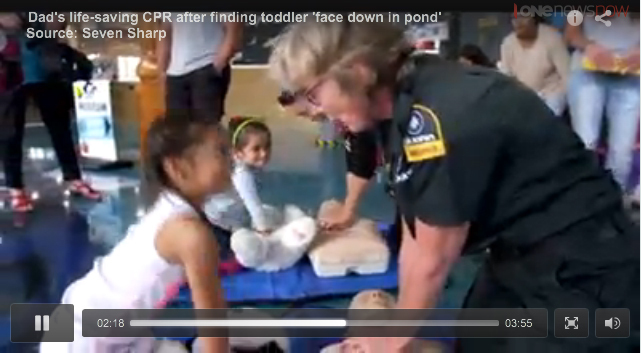 Emcare July Update I Why do a CPR course? When delivering our courses, we hear from Health Professionals who have done a number of CPR courses over the years, and who feel forced to attend a course. No matter how many courses you do, you can never be too prepared for an emergency - and these often occur outside of your workplace. It features a father who had to perform CPR on his daughter after finding her face down in a pond. Not something any of us would want to deal with, however this highlights that perhaps CPR should be viewed as a life skill, rather than something compulsory. This months top tip is from Philippe Gianni - a dentist at Lumino Ponsonby in Auckland. We give out algorithms on courses, and if you are not sure where to keep them, simply use Philippes' tip - attach them to the back of pictures that you have in your surgery/practice. They are out of sight when not needed, and if you do need them simply turn the picture over! The College of Child and Youth Nurse of NZ is having a one day conference in Tauranga, the day before the Paediatric Society ASM. Please open here for details. A leadership change at Auckland Communities Foundation (ACF) paves the way for its continued growth as the premier donor service provider for private philanthropy in Auckland. Whilst the Board of ACF is sorry to lose outgoing CEO Hilary Sumpter, it is condfident that newly appointed Chief Executive, Dellwyn Stuart, will quickly build on the progress the organisation has made. Dellwyn joins ACF on 1 August 2016, replacing Hilary who has led the foundation through a period of significant growth during the last three years. The new CEO has a thirty-year career spanning corporate and private business roles, the NFP sector and revitalising and leading a major grant-making foundation. Her most recent experience includes trustee roles for Philanthropy New Zealand, the Project Crimson Trust and Cure Kids, Executive Directorship with the Stevenson Foundation, and a year as Interim CEO at Cure Kids. The appointment of a new CEO follows other positive changes at ACF, which increase its capacity and capability in the Auckland philanthropic sector. A new Philanthropy Services Manager, Lettie Bright has joined the team, having worked for nearly seven years in the relationships team at Oxfam New Zealand. Prior to that she worked at the Auckland University Business School whilst also studying. With these changes Auckland Communities Foundation is set to continue to make a lasting and positive contribution to the growth of private philanthropy in Auckland and will continue to champion long-term, sustainable progress in the key areas challenging our city. We are accepting bookings for the next Talking Trouble Aotearoa NZ workshops for professionals who work with vulnerable children/youth. The aim of these is to equip professionals with knowledge and practical skills to identify and assist those children and youth who may be experiencing difficulties expressing themselves or fully following what is being said to them. The general 1 day workshop will run on Friday, 19 August 2016 in Auckland and will be repeated on Friday, 21 October 2016. An additional 'extension' workshop for people who have already done the general 1 day one will be run on 4 November 2016 and will focus more specifically on strategies and tools for youth justice and care and protection contexts. Information on the flyer. Feel free to share! There is a free place kindly sponsored by The Braveheart Trust available at the August workshop for someone who works with young people involved with the Courts. First come, first served for that one. Please let us know if you would like us to stop sending any emails to you about our events. From online programmes to serious games, video teleconferencing and text counselling, digital platforms lend themselves to providing preventative and self-managed care options. Commonly cited benefits include consumer empowerment, scalability, possible efficiency gains, reduced burden and social cost, standardisation of programmes and access to usage data. But how confident are we that such initiatives actually work? · challenges in implementation, uptake, and quality assurance. We conclude there is a lot of potential for going digital in delivering services, if done the right way. Please find Issue 73 of Court in the Act. We value your contributions. If you would like to contribute to Court in the Act, please send all submissions to courtintheact@justice.govt.nz. Here’s your July edition of the Nursing Pulse. Our e-bulletin includes links to a variety of interesting websites and articles about a wide range of disability issues. Feel free to email any interesting news or upcoming events to Disability Connect and we will endeavour to include in our next e-bulletin due to go out the week beginning 18th July 2016.